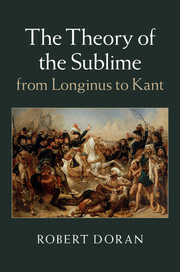 The Theory of the Sublime "offers the first in-depth treatment of the major theories of the sublime, from the ancient Greek treatise On the Sublime (attributed to 'Longinus') and its reception in early modern literary theory to the philosophical accounts of Burke and Kant. Doran explains how and why the sublime became a key concept of modern thought and shows how the various theories of sublimity are united by a common structure—the paradoxical experience of being at once overwhelmed and exalted—and a common concern: the preservation of a notion of transcendence in the face of the secularization of modern culture. Combining intellectual history with literary theory and philosophical analysis, his book provides a new, searching and multilayered account of a concept that continues to stimulate thought about our responses to art, nature and human events." For more information, visit the Cambridge UP website.